Ned Oldham: Connie. Yeah, it’s Ned. Connie: Did you throw that switch yet? Ned Oldham: Yeah, six minutes ago. But your train, it’s not here. I thought it might be going a little slower than you guessed, but these two numb nuts that you sent, they just showed up and they ain’t seen it either. Connie: Are you saying our train’s already passed? Ned Oldham: Yes, ma’am. That’d be my guess. Connie: It’s not a coaster. That train’s under power. Ned Oldham: That’d be my guess, too. 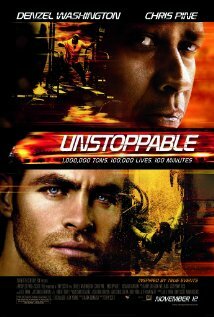 In the movie, Unstoppable, Denzel Washington, Chris Pine and Rosario Dawson star in this action film where a chemical laden runaway train has to be stopped before potential disaster. The film is “inspired by true events” and although is critiqued for its unrealistic details, is still a gripping and entertaining film if you’re willing to let those details go. Denzel Washington plays engineer Frank Barnes on his way out (involuntarily) and Chris Pine plays Will Coleson who is just coming in as a conductor. A failure to pay attention to detail and then a backhanded method of trying to fix it by the guys at the yard, as well as lack of full disclosure of the problem, sets things in motion and a minor issue starts a chain of events that leads to potential disaster. Not for you: How often in life do we do something that will benefit someone, but ultimately also benefit someone with whom you have issues? Oscar Galvin: I am not going to jeopardize any more property or personnel just because some engineer wants to play *hero*! Now you stop your pursuit or I will fire you! Frank: [chuckles] Fire… You already did. Oscar Galvin: Already did what? Frank: You’ve already fired me. I received my 90 day notice in the mail… 72 days ago. Forced early retirement. Half benefits. Galvin: So, you’re going to risk your life for us with three weeks left. Frank: Not for you. I’m not doing it for you. Normally, those things irritate us to no end, but there’s usually not life at stake. Are you content to stand back and just do your job or do you need to be the hero? Why? Frank and Will head in to something unbelievably dangerous because they feel like it’s the right thing to do. They had every right not to do it; the potential of fired, one life had already been claimed (you’ll see), and everything seemed to be going against them, but they felt compelled to do it anyway. We’re all focused on who we’re really working for – that’s good, very good! We just have to keep reminding ourselves who we’re really doing our work for – and hopefully God is at the top of the list! Cooperation is a REQUIREMENT! One thing about this movie, whether it’s in the relationship background stories or the way they handle the runaway train, is how much cooperation is needed. We see what happens when people work together… and what happens when they think they know it all and don’t need anyone. I always hated group work as a student, but professionally, I love a team atmosphere and team work. When everyone gels, massive things get done – but if one person holds back, or insists on their way, it certainly makes things difficult! In what ways are you a team player? In what ways are you not? What can you do to help that? We’re all called to share our gifts to build up the body of Christ!!! If we all used our gifts as God calls us to, we can do AMAZING things to bring others to Him. Let’s get moving!! When you’re in an argument with someone, sometimes you have to imagine how you’d feel if they were in danger. Would the argument matter? Will and his wife have had a bit of a “misunderstanding.” This misunderstanding has led to a restraining order and Will sleeping on his brother’s couch. But, we see that when Will’s wife realizes that Will is in definite danger, the misunderstanding melts away and we are led to understand they worked things out. As much as I don’t want to sometimes, when the hubs and I argue, I try to keep this in mind before either of us leaves the house. Would I really want angry words to be our last to each other? I’m not saying bury the issues. Remember that deep down you love each other and keep that in mind even though you might not like each other very much at the moment. Obviously, this can also apply to other relationships… Parents and children, siblings, friends, etc. all have to remember this. So, is there someone in your life that you need to reconcile with before they are taken from this earth and you lose your chance? Do you “quit too easy?” When Will tells the story of his marriage woes and his attempts to reconcile with his wife, Frank tells him that he (Will) quit too easily. Sound familiar? Many people seem to forget that there is work to making a marriage. Don’t get me wrong, some people seem to have to work harder than others, but there is a need to communicate feelings, finances and everything else. I have friends who laugh about the “marriage is work” statement because they never felt it was work, but I promise, whether it was conscious or not, they have to work on it. They have four kids and another due any day. The kids are in scouting, sports and all that. They still talk to each other, have “date nights” and its more than just coordinating kids schedules. But, they’ve found a balance that works for them and they’ve got it down in such a way they don’t find it to be work. Again, this concepts applies to more than just marriage. It can be a job, relationship, a goal, whatever… You may have a long-lasting marriage, but do you “quit too easy” about something else? We’re all God’s children: At one point, Frank and Will are discussing families and we hear that Frank’s daughters are Hooter’s waitresses (there are a few shots of them at the restaurant, too). Will raises an eyebrow and asks how Frank feels about that. Frank says he has gotten used to it, but you can tell he’s not happy about it. As “men” they “love” Hooters, but as a father, not so much. So, this can be a good opportunity to show how people react to how we present ourselves AND help us to remember that we are all children of God. Whether it’s a man checking out a scantily clad woman or the reverse, we have to remember that object we’re ogling is a child of God – and how would he feel about us objectifying one of His children that way? This is a responsibility we all bear. This is not just a “women cover yourselves” issue. We all play a part. Not a whole lot of places to go. One thing about a train is how it cannot run without it’s track. There’s no jumping off track and running cross country or even down a standard highway. When it goes off the track, it’s usually pretty bad. That’s why when we say things like “we’re on track” or “we’re heading down the right track”, it indicates things are good. When we get off track, it’s usually not good. What things make up your track? What helps keep you on track? What knocks you on track? What do you do to get back on track when you get derailed? What high speed train is running through your life right now? How are you handling it? Cut it off from up front? Trying to derail it? Grab it from behind? What has been your experience with it? Triple seven – what does it mean? 777 has been considered to be the perfect number, which is why 666 is supposed to be the “mark of the beast” (three time falls short of 7) – so, do you think there might be some significance in that number being chosen as the runaway train and not 1206 which is the train that they use to try to stop 777. Triple seven is obviously is extremely powerful – blowing through train cars as if they were tissue paper and flying down the track. Do you think it was intentional – or just convenient? Is it a way of saying that God is unstoppable and that whatever we think we can do to control the situation is nothing compared to His power? What other meanings might it have? It’s a wrap: I have to admit, when I threw my copy of Unstoppable in the Blu-ray I wasn’t sure what I was going to be able to glean from it… I just enjoy it and felt drawn to write on it. This is not a kids movie by any stretch. It is rated PG-13 with good reason, the language being the worst – and for the most part, the foul language is limited to the characters responsible for the runaway train, but it is a high-pressure situation, so the f-word flies around a bit. The only thing sexual is watching Frank’s girls in their short shorts and skin tight clothes. It is an intense film, but not violent or gory. So it should be okay for adolescents – but as always, review it first.